In this fabulous and instructive blend of tale and history, children ages 5 – 8 will be inspired by the lore and legend of the faith. Boys and girls alike will be captivated by Helen, a heroic empress on a mission, and will be encouraged to treasure the Holy Cross in their own lives! As children accompany Helen on her quest to find the true cross upon which Jesus died, they will relive her adventures. They will experience Helen's excitement when she thinks she has discovered the "X" that marks the spot-sweet-smelling basil-since basil is the herb of kings and Jesus is the King of Life. But just as it seems that the site of the Holy Cross has been identified, not one, but three crosses are found while digging? 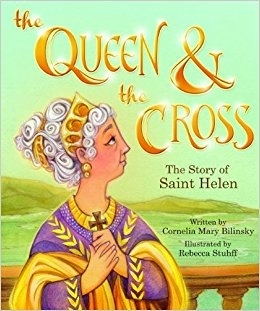 Discover the legend of the Holy Cross and learn all about Helen's thrilling life! Cornelia Mary Bilinsky was born and raised in Manitoba, Canada. She received her Bachelor of Arts Degree in English and Theology from St. Paul's College at the University of Manitoba, and taught English and English as a Second Language at the high school level. Cornelia's husband is a Ukrainian Catholic priest. They currently reside in Oshawa, Ontario, and have one daughter and one granddaughter. Since 1981, Cornelia has worked alongside her husband at Ukrainian Catholic parishes in Ontario. She most enjoys teaching children about the faith with stories, plays, and songs.